Claude-Achille Debussy (French pronunciation: [klod aʃil dəbysi]) (August 22, 1862 – March 25, 1918) was a French composer. Along with Maurice Ravel, he was one of the most prominent figures working within the field of impressionist music, though he himself intensely disliked the term when applied to his compositions. Debussy is among the most important of all French composers, and a central figure in European music of the turn of the 20th century. He was made Chevalier de la Légion d'honneur in 1903. His music is noted for its sensory component and how it is not often formed around one key or pitch. Often Debussy's work reflected the activities or turbulence in his own life. His music virtually defines the transition from late-Romantic music to 20th century modernist music. In French literary circles, the style of this period was known as symbolism, a movement that directly inspired Debussy both as a composer and as an active cultural participant. Claude Debussy was born in Saint-Germain-en-Laye, France in 1862, the eldest of five children. His father, Manuel-Achille Debussy, owned a shop where he sold china and crockery, and his mother, Victorine Manoury Debussy, was a seamstress. They moved to Paris in 1867. In 1870, his pregnant mother sought refuge from the Franco-Prussian war with a paternal aunt of Claude's in Cannes and it was here that he began piano lessons when he was seven years old with an elderly Italian violinist named Cerutti; his lessons were paid for by his aunt. In 1871, the young Debussy gained the attention of Marie Mauté de Fleurville, who claimed to have been a pupil of Frédéric Chopin, and Debussy always believed her, although there is no independent evidence that she was. His talents soon became evident, and in 1872, at age ten, Debussy entered the Paris Conservatoire, where he spent eleven years. During his time there he studied composition with Ernest Guiraud, music history/theory with Louis-Albert Bourgault-Ducoudray, harmony with Émile Durand, piano with Antoine François Marmontel, organ with César Franck, and solfège with Albert Lavignac, as well as other significant figures of the era. He also became lifelong friend of fellow student and noted pianist Isidor Philipp. After Debussy's death, many pianists sought out Philipp for advice on playing his music. From the start, though clearly talented, Debussy was also argumentative and experimental, and he challenged the rigid teaching of the Academy, favoring instead dissonances and intervals which were frowned upon at the time. Like Georges Bizet, Debussy was a brilliant pianist and an outstanding sight reader, who could have had a professional career as such had he so wished. The pieces he played in public at this time included sonata movements by Beethoven, Schumann and Weber; and Chopin - the Ballade No. 2, a movement from the Piano Concerto No. 1, and the Allegro de Concert, a relatively little-known piece that demands an even higher degree of virtuosity than either of the concertos. From 1880 to 1882, he lived in Russia as music teacher to the children of Nadezhda von Meck, the patroness of Tchaikovsky. Despite von Meck's closeness with Tchaikovsky, the Russian master appears to have had little or no effect on Debussy. In September 1880 she sent Debussy's Danse bohémienne for Tchaikovsky's perusal. A month later Tchaikovsky wrote back to her, "It is a very pretty piece, but it is much too short. Not a single idea is expressed fully, the form is terribly shriveled, and it lacks unity". Debussy did not publish the piece; the manuscript remained in the von Meck family, and it was sold to B. Schott's Sohne in Mainz, and published by them in 1932. More influential was Debussy's close friendship with Madame Vasnier, a singer he met when he began working as an accompanist to earn some money. She and her husband gave Debussy emotional and professional support. Monsieur Vasnier introduced him to the writings of influential French writers of the time which gave rise to his first songs, settings of poems by Paul Verlaine, his former teacher Mme. Mauté de Fleurville's son-in-law. As the winner of the 1884 Prix de Rome with his composition L'Enfant prodigue, he received a scholarship to the Académie des Beaux-Arts, which included a four-year residence at the Villa Medici, the French Academy in Rome, to further his studies (1885–1887). According to letters to Madame Vasnier, perhaps in part designed to gain her sympathy, he found the artistic atmosphere stifling, the company boorish, the food bad, and the monastic quarters "abominable". Neither did he delight in the pleasures of the "Eternal City", finding the Italian opera of Donizetti and Verdi not to his taste. Debussy was often depressed and unable to compose, but he was inspired by Franz Liszt, whose command of the keyboard he found admirable. In June 1885, Debussy wrote of his desire to follow his own way, saying, "I am sure the Institute would not approve, for, naturally it regards the path which it ordains as the only right one. But there is no help for it! I am too enamoured of my freedom, too fond of my own ideas." Debussy finally composed four pieces that were sent to the Academy: the symphonic ode Zuleima, based on a text by Heinrich Heine; the orchestral piece Printemps; the cantata La damoiselle élue (1887–1888), which was criticized by the Academy as "bizarre"; and the Fantaisie for piano and orchestra. The third piece was the first in which stylistic features of Debussy's later style emerged. The fourth piece was heavily based on César Franck's music and withdrawn by Debussy himself. Overall, the Academy chided him for "courting the unusual" and hoped for something better from the gifted student. Even though Debussy showed touches of Jules Massenet in his efforts, Massenet himself concluded, "He is an enigma." In his visits to Bayreuth in 1888-9, Debussy was exposed to Wagnerian opera, which had a lasting impact on his work. Richard Wagner had died in 1883 and the cult of Wagnerism was still in full swing. Debussy, like many young musicians of the time, responded positively to Wagner's sensuousness, mastery of form, and striking harmonies, but ultimately Wagner's extroverted emotionalism was not to be Debussy's way either. Wagner's influence is evident in La damoiselle élue and the 1889 piece Cinq poèmes de Baudelaire. Other songs of the period, notably the settings of Verlaine—Ariettes oubliées, Trois mélodies, and Fêtes galantes are all in a more capricious style. Around this time, Debussy met Erik Satie, who proved a kindred spirit in his experimental approach to composition and to naming his pieces. During this period, both musicians were bohemians enjoying the same cafe society and struggling to stay afloat financially. During 1889, at the Exposition Universelle in Paris, Debussy heard Javanese gamelan music. Although direct citations of gamelan scales, melodies, rhythms, or ensemble textures have not been located in any of Debussy's own compositions, the equal-tempered pentatonic scale appears in his music of this time and afterward. Debussy's private life was often turbulent. At the age of 18 he began an eight-year affair with Madame Blanche Vasnier, wife of a wealthy Parisian lawyer. The relationship eventually faltered following his winning of the Prix de Rome and obligatory incarceration in the eponymous city. On his permanent return to Paris in 1889, he began a tempestuous nine-year relationship with Gabrielle ('Gaby') Dupont, a tailor's daughter from Lisieux, with whom he cohabited on the Rue Gustave Doré. During this time he also had an affair with the singer Thérèse Roger, to whom he was briefly engaged. He left Dupont for her friend Rosalie ('Lily') Texier, a fashion model whom he married in 1899. Although Texier was affectionate, practical, straightforward, and well-liked by Debussy's friends and associates, he became increasingly irritated by her intellectual limitations and lack of musical sensitivity. In 1904, Debussy was introduced to Emma, wife of Parisian banker Sigismond Bardac, by her son Raoul, one of his students . In contrast to Texier, Bardac was a sophisticate, a brilliant conversationalist, and an accomplished singer. Debussy soon abandoned Texier; distraught, like Dupont before her, she attempted suicide, shooting herself in the chest while standing in the Place de la Concorde. She survived, although the bullet remained lodged in her vertebrae for the rest of her life. The scandal obliged Debussy and Bardac (already carrying his child) to elope to England, via Jersey, in April 1905. The couple ultimately settled at the Grand Hotel in Eastbourne, where Debussy was to complete his symphonic suite La Mer, and celebrate his divorce from Texier on August 2, 1905. Claude and Emma returned to Paris that autumn in time for the birth of their child, a daughter (and the composer's only child), Claude-Emma, on 30 October. More affectionately known as 'Chouchou', Claude-Emma was the dedicatee of Debussy's Children's Corner suite; she outlived her father by scarcely a year, succumbing to the diphtheria epidemic of 1919. Her parents were eventually married in 1908, their troubled union enduring until Debussy's death in 1918. Claude Debussy died of rectal cancer in Paris on March 25, 1918, in the midst of the aerial and artillery bombardment of the city during the Spring Offensive of World War I. The funeral procession made its way through deserted streets to Père Lachaise cemetery as shells from the German guns ripped into his beloved city. At this time, the military situation in France was desperate, and circumstances did not permit his being paid the honour of a public funeral or ceremonious graveside orations. It was just eight months before France would celebrate victory. 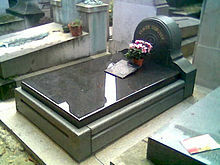 Debussy's body was reinterred shortly afterwards in the small Cimetière de Passy sequestered behind the Trocadéro; his wife and daughter are buried with him. French culture has ever since celebrated Debussy as one of its most distinguished representatives. Chords, featuring chromatically altered sevenths and ninths and progressing unconventionally, explored by Debussy in a, "celebrated conversation at the piano with his teacher Ernest Guiraud". List of compositions by Claude Debussy by category. Beginning in the 1890s, Debussy developed his own musical language largely independent of Wagner's style, colored in part from the dreamy, sometimes morbid romanticism of the Symbolist Movement. Debussy became a frequent participant at Stéphane Mallarmé's Symbolist gatherings, where Wagnerism dominated the discussion. In contrast to the enormous works of Wagner and other late-romantic composers, however, around this time Debussy chose to write in smaller, more accessible forms. The Deux Arabesques is an example of one of Debussy's earliest works, already developing his musical language. Suite bergamasque (1890) recalls rococo decorousness with a modern cynicism and puzzlement. This suite contains one of Debussy's most popular pieces, Clair de Lune. Debussy's String Quartet in G minor (1893) paved the way for his later, more daring harmonic exploration. In this work he utilized the Phrygian mode as well as less standard scales, such as the whole-tone, which creates a sense of floating, ethereal harmony. Debussy was beginning to employ a single, continuous theme and break away from the traditional A-B-A form, with its restatements and amplifications, which had been a mainstay of classical music since Haydn. Influenced by Mallarmé, Debussy wrote one of his most famous works, the revolutionary Prélude à l'après-midi d'un faune, truly original in form and execution. In contrast to the large orchestras so favoured by late-romanticism, Debussy wrote this piece for a smaller ensemble, emphasizing instrumental colour and timbre. Despite Mallarmé himself, and colleague and friend Paul Dukas having been impressed by the piece, it was controversial at its premiere. Prélude subsequently placed Debussy into the spotlight as one of the leading composers of the era. The three Nocturnes (1899), include characteristic studies in veiled harmony and texture as demonstrated in Nuages; exuberance in Fêtes; and whole-tones in Sirènes. Contrasting sharply with Wagnerian opera, Debussy's Pelléas et Mélisande premiered in 1902, after ten years of work. It would be his only complete opera. Based on the play by Maurice Maeterlinck, the opera proved to be an immediate success and immensely influential to younger French composers, including Maurice Ravel. These works brought a fluidity of rhythm and colour quite new to Western music. La Mer (1903–1905) essays a more symphonic form, with a finale that works themes from the first movement, although the middle movement, Jeux de vagues, proceeds much less directly and with more variety of colour. Again, the reviews were sharply divided. Some critics thought the treatment to be less subtle and less mysterious than his previous works and even a step backward. Pierre Lalo complained "I neither hear, nor see, nor feel the sea". Others extolled its "power and charm", its "extraordinary verve and brilliant fantasy", and its strong colors and definite lines. During this period Debussy wrote much for the piano. The set of pieces entitled Pour le piano (1901) utilises rich harmonies and textures which would later prove important in jazz music. His first volume of Images pour piano (1904–1905) combine harmonic innovation with poetic suggestion: Reflets dans l'eau is a musical description of rippling water; Hommage à Rameau, the second piece, is slow and yearningly nostalgic. It takes as its inspiration a melody from Jean-Philippe Rameau's Castor et Pollux. The evocative Estampes for piano (1903) give impressions of exotic locations. Debussy came into contact with Javanese gamelan music during the 1889 Paris Exposition Universelle. Pagodes is the directly inspired result, aiming for an evocation of the pentatonic structures employed by the Javanese music. Debussy wrote his famous Children's Corner Suite (1908) for his beloved daughter, Claude-Emma, whom he nicknamed Chouchou. The suite recalls classicism—the opening piece Doctor Gradus ad Parnassum refers to Muzio Clementi's collection of instructional piano compositions Gradus ad Parnassum, as well as a new wave of American ragtime music. In the popular final piece of the suite, Golliwog's Cakewalk, Debussy also pokes fun at Richard Wagner by mimicking the opening bars of Wagner's prelude to Tristan and Isolde. The first book of Préludes (1910), twelve in total, proved to be his most successful work for piano. The Preludes are frequently compared to those of Chopin. Debussy's preludes are replete with rich, unusual and daring harmonies. They include the popular La Fille aux Cheveux de Lin (The Girl with the Flaxen Hair) and La Cathédrale Engloutie (The Engulfed Cathedral). Debussy wanted people to respond intuitively to these pieces and so he placed the titles at the end of each one in the hope that listeners would not make stereotype images as they listened. Larger scaled works included his orchestral piece Iberia (1907), began as a work for two pianos, a triptych medley of Spanish allusions and fleeting impressions and also the music for Gabriele d'Annunzio's mystery play Le martyre de St. Sébastien (1911). A lush and dramatic work, written in only two months, it is remarkable in sustaining a late antique modal atmosphere that otherwise was touched only in relatively short piano pieces. During this period, as Debussy gained more popularity, he was engaged as a conductor throughout Europe, most often performing Pelléas, La Mer, and Prélude à l'après-midi d'un faune. He was also an occasional music critic to supplement his conducting fees and piano lessons. Debussy avoided analytical dissection and attempts to force images from music, "Let us at all costs preserve this magic peculiar to music, since of all the arts it is most susceptible to magic." He could be caustic and witty, sometimes sloppy and ill-informed. Debussy was for the most part enthusiastic about Richard Strauss and Igor Stravinsky, worshipful of Chopin, Johann Sebastian Bach and Mozart, and found both Liszt and Beethoven geniuses who sometimes lacked "taste". Schubert and Mendelssohn fared much worse, the latter he described as a "facile and elegant notary". He also admired the works of Charles-Valentin Alkan. Debussy's harmonies and chord progressions frequently exploit dissonances without any formal resolution. Unlike in his earlier work, he no longer hides discords in lush harmonies. The forms are far more irregular and fragmented. These chords that seemingly had no resolution were described by Debussy himself as "floating chords", and were used to set tone and mood in many of his works. The whole tone scale dominates much of Debussy's late music. His two last volumes of works for the piano, the Études (1915) interprets similar varieties of style and texture purely as pianistic exercises and includes pieces that develop irregular form to an extreme as well as others influenced by the young Igor Stravinsky (a presence too in the suite En blanc et noir for two pianos, 1915). The rarefaction of these works is a feature of the last set of songs, the Trois poèmes de Mallarmé (1913), and of the Sonata for flute, viola and harp (1915), though the sonata and its companions also recapture the inquisitive Verlainian classicism. With the sonatas of 1915–1917, there is a sudden shift in the style. These works recall Debussy's earlier music, in part, but also look forward, with leaner, simpler structures. Despite the thinner textures of the Violin Sonata (1917) there remains an undeniable richness in the chords themselves. This shift parallels the movement commonly known as neo-classicism which became popular after Debussy's death. Debussy planned a set of six sonatas, but this plan was cut short by his death in 1918 so that he only completed three (cello, flute-viola-harp and violin sonatas). The last orchestral work by Debussy, the ballet Jeux (1912) written for Serge Diaghilev's Ballets Russes, contains some of his strangest harmonies and textures in a form that moves freely over its own field of motivic connection. At first Jeux was overshadowed by Igor Stravinsky's The Rite of Spring, composed in the same year as Jeux and premiered only two weeks later by the same ballet company. Decades later, composers such as Pierre Boulez and Jean Barraqué pointed out parallels to Anton Webern's serialism in this work. Other late stage works, including the ballets Khamma (1912) and La boîte à joujoux (1913) were left with the orchestration incomplete, and were later completed by Charles Koechlin and André Caplet, who also helped Debussy with the orchestration of Gigues (from Images pour orchestre) and Le martyre de St. Sébastien. The second set of Preludes for piano (1913) features Debussy at his most avant-garde, where he utilizes dissonant harmonies to evoke specific moods and images. Debussy consciously gives titles to each prelude that amplify the preludes’ tonal ambiguity and dissonance. He utilizes scales such as the whole tone scale, musical modes, and the octatonic scale in his preludes that exaggerate this tonal ambiguity, making the key of each prelude almost indistinguishable at times. The second book of Preludes for piano represents Debussy’s strong interest in the indefinite and esoteric. Although Pelléas was Debussy's only completed opera, he began several opera projects which remained unfinished, his fading concentration, increasing procrastination, and failing health perhaps the reasons. He had finished some partial musical sketches and some unpublished libretti for operas based on Poe's The Devil in the Belfry (Le diable dans le beffroi, 1902-?1912) and The Fall of the House of Usher (La chute de la maison Usher, 1908–1917) as well as considered projects for operas based on Shakespeare's As You Like It and Joseph Bedier's La Legende de Tristan. Further plans, such as an American tour, more ballet scores, and revisions of Chopin and Bach works for re-publication, were all cut short by the outbreak of World War I and the onset of colorectal cancer, which required morphine injections to relieve the pain. Debussy underwent one of the first colostomy operations ever performed in December 1915, but this achieved only a temporary respite and occasioned him considerable frustration; he was to liken dressing in the morning to "all the labours of Hercules in one". The only evidence that Howat introduces to support his claim appears in changes Debussy made between finished manuscripts and the printed edition, with the changes invariably creating a Golden Mean proportion where previously none existed. Perhaps the starkest example of this comes with La cathédrale engloutie. Published editions lack the instruction to play bars 7-12 and 22-83 at twice the speed of the remainder, exactly as Debussy himself did on a piano-roll recording. When analysed with this alteration, the piece follows Golden Section proportions. At the same time, Howat admits that in many of Debussy's works, he has been unable to find evidence of the Golden Section (notably in the late works) and that no extant manuscripts or sketches contain any evidence of calculations related to it. Debussy had a wide range of influences. Among the Russian composers of his time, the most prominent influences on Debussy were Tchaikovsky, Balakirev, Rimsky-Korsakov, Borodin and Mussorgsky. It can be inferred that from the Russians “Debussy acquired his taste for ancient and oriental modes and for vivid colorations, and a certain disdain for academic rules.” Specifically, Musorgsky’s opera Boris Godunov directly influenced one of Debussy’s most famous works, Pelléas et Mélisande. In addition to the Russian composers, one of Debussy’s biggest influences was Richard Wagner. According to Pierre Louys, Debussy “did not see ‘what anyone can do beyond Tristan.” After Debussy’s Wagner phase, he started to become immensely interested in non-western music. He was drawn to unorthodox approaches to composition that non-western music utilized. Specifically, he was drawn to a Javanese Gamelan, which was a musical ensemble from the island of Java that played an array of unique instrumentation. He first heard the gamelan at the 1889 Paris Exposition. Debussy was not as interested in directly citing his non-western influence in his music, but instead used his non-western influence to shape his unique musical style in more of a general way. Debussy was just as influenced, if not more influenced by other art forms than he was by music. He took a strong interest in literature and visual art and used these mediums to help shape his unique musical style. Debussy was heavily influenced by the French symbolist movement, which was an art movement in 1885 that influenced art forms such as poetry, visual art, and theatre. He shared the movement’s interest in the esoteric and indefinite and rejection of naturalism and realism. Specifically, “the development of free verse in poetry and the disappearance of the subject or model in painting influenced Debussy to think about issues of musical form.” Debussy became personally acquainted with writers and painters of the movement and based his own works off of those of the symbolists. One of Debussy’s main influences was the famous poet Stéphane Mallarmé, who “held the idea of a ‘musicalization’ of poetry.” In other words, Mallarmé drew strong connections between music and his poetry. Debussy wrote "Prélude à l'après-midi d'un faune", which was directly influenced by Mallarmé’s poem “Afternoon of a Faun.” Like the symbolists in respect to their own art forms, Debussy aimed to reject common techniques and approaches to composition and attempted to evoke more of a sensorial experience for the listener with his works. Since his time at the Paris Conservatoire, Debussy believed he had much more to learn from artists than from musicians who were primarily interested in their musical careers. Claude Debussy is widely regarded as one of the most influential composers of the 20th century. His harmonies, considered radical in his day, were influential to almost every major composer of the 20th century, especially the music of Maurice Ravel, Igor Stravinsky, Olivier Messiaen, Béla Bartók, Pierre Boulez, Henri Dutilleux, and the minimalist music of Steve Reich and Philip Glass as well as the influential Japanese composer Toru Takemitsu. He also influenced many important figures in Jazz, most notably George Gershwin, Bill Evans, George Shearing, Thelonious Monk, Duke Ellington, Antônio Carlos Jobim, Herbie Hancock and Jimmy Giuffre. Furthermore, he had a profound impact on contemporary soundtrack composers such as John Williams because Debussy's colorful and suggesting style translated easily into an emotional language for use in motion picture scores. In 1999, The Art of Noise released a concept album titled "The Seduction of Claude Debussy". The group blended the music of Debussy with drum and bass, opera, hip hop, jazz, and narration, and described the album as "the soundtrack to a film that wasn't made about the life of Claude Debussy". In 2000, the band released Reduction, a limited-edition album composed mainly of outtakes from this album. Leopold Stokowski, in an article, pointed out the identification of composers including Debussy with the music of Giovanni Pierluigi da Palestrina, providing an inspiration for non-contrapuntal music. Debussy: Préludes, Book 2: IX. Hommage À S. Pickwick, Esq., P.P.M.P.C. 4492 Debussy, a main belt asteroid which was discovered in 1988. Debussy participated in a handful of recordings, made in 1904, with soprano Mary Garden. He also made some piano rolls for Welte Mignon in 1913. ^ Debussy, Claude Achille The Columbia Electronic Encyclopedia, 6th ed. Columbia University Press. Accessed 12 July 2010. ^ Claude-Achille Debussy Virginia Tech Multimedia Music Dictionary Composer Biographies. Accessed 12 July 2010. ^ Politoske, Daniel T.; Martin Werner (1988). Music, Fourth Edition. Prentice Hall. p. 419. ISBN 0-13-607616-5. ^ "Claude Debussy — Biographie : 1903 - 1909 - Centre de documentation Claude Debussy". Debussy.fr. http://www.debussy.fr/cdfr/bio/bio5_03-09.php. Retrieved 2010-03-10. ^ Hartmann, Arthur; Hsu, Samuel; Grolnic, Sidney; Peters, Mark A. (2003). "Claude Debussy as I Knew Him" and Other Writings of Arthur Hartmann. Boydell & Brewer. ISBN 1580461042. http://books.google.com/books?id=fp5pM0oiUucC. ^ Léon Vallas: ''Claude Debussy - His Life and Works''. Books.google.com.au. http://books.google.com.au/books?id=shLCyqsb4qoC&pg=PA4&lpg=PA4&dq=maute+de+fleurville&source=web&ots=NRCOAInYRB&sig=Mbg5JwDqGTA9E9Xx9zRcj8hsTdQ&hl=en&sa=X&oi=book_result&resnum=2&ct=result#PPA3,M1. Retrieved 2010-03-10. ^ Greene's Biographical Encyclopedia of Composers. Books.google.com.au. http://books.google.com.au/books?id=m3S7PIxe0mwC&pg=PA904&lpg=PA904&dq=frederic+chopin+notable+pupil&source=web&ots=KT6MwTTaW4&sig=jCt4lmJ2Wyo64vUCEM4Adn9xkIA&hl=en&sa=X&oi=book_result&resnum=4&ct=result#PPA904,M1. Retrieved 2010-03-10. ^ "Concerts where Debussy appeared as a pianist". Djupdal.org. http://www.djupdal.org/karstein/debussy/concerts.shtml. Retrieved 2010-03-10. ^ Archangel Fashion Cat (.ed) (2002-01-23). "Claude Debussy - the Composer". BBC h2g2. http://www.bbc.co.uk/dna/h2g2/alabaster/A684272. Retrieved 2007-04-20. ^ Enget, D. (2005). Debussy in Jersey. The centenary, 1904-2004 . ^ Lockspeiser, Edward (1962). Debussy: His Life and Mind, p.207. ISBN 0304918784 for Vol. 1. cited in Nadeau, Roland (Sep., 1979), "Debussy and the Crisis of Tonality", p.71, Music Educators Journal, Vol. 66, No. 1, pp. 69-73. ^ Reti, Rudolph (1958). Tonality, Atonality, Pantonality. Westport, CT: Greenwood Press. ISBN 0313204780. ^ Brent Hugh. "Claude Debussy and the Javanese Gamelan". brenthugh.com. http://brenthugh.com/debnotes/gamelan.html. Retrieved 2007-01-27. ^ "The Myths of Alkan". Jack Gibbons. http://www.jackgibbons.com/alkanmyths.htm. Retrieved 2010-03-10. ^ a b Howat, Roy (1983). Debussy in Proportion: A musical analysis. Cambridge University Press. ISBN 0521311454. ^ a b c d e François Lesure and Roy Howat. "Debussy, Claude." Grove Music Online. Oxford Music Online. 14 Dec. 2009 <http://www.oxfordmusiconline.com/subscriber/article/grove/music/07353>. ^ "Steve's Debussy Page". Homepage.mac.com. 1913-11-01. http://homepage.mac.com/stevepur/music/debussy_plays.html. Retrieved 2010-03-10. Barraqué, Jean (1977). Debussy (Solfèges). Paris: Editions du Seuil. ISBN 2020002426. Fulcher, Jane (ed.) (2001). Debussy and His World (The Bard Music Festival). Princeton: Princeton University Press. ISBN 0691090424. Trezise, Simon (ed.) (2003). The Cambridge Companion to Debussy. Cambridge University Press. ISBN 0521654785. Roberts, Paul (ed.) (2001). Images: The Piano Music of Claude Debussy. Amadeus Press. ISBN 1574670689. Roberts, Paul (ed.) (2007). Claude Debussy (20th Century Composers). Phaidon Press Ltd. ISBN 0714835129. Lücke, Hendrik (2005): Mallarmé - Debussy. Eine vergleichende Studie zur Kunstanschauung am Beispiel von „L'Après-midi d'un Faune“. (= Studien zur Musikwissenschaft, Bd. 4). Dr. Kovac, ISBN 3-8300-1685-9. James Ross, "Pelléas et Mélisande: The 'Nouveau Prophete'? ", Crisis and Transformation: French Opera, Politcs and the Press (Oxford University D.Phil. Thesis, 1998), pp. 164–208. This article is licensed under the GNU Free Documentation License. It uses material from the Wikipedia article "Claude Debussy. Allthough most Wikipedia articles provide accurate information accuracy can not be guaranteed. © classiccat.net. All rights reserved.